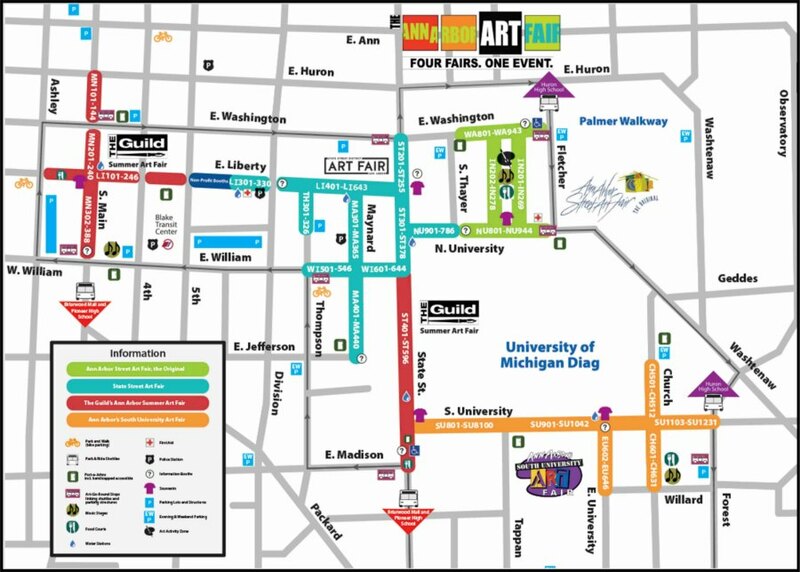 The Ann Arbor Art Fair in Michigan is THE art fair of the summer!! It occurs around the third week of July for four days. Navigate like a pro with our map and insider Tips and Tricks! If you are going to pick just one art fair this summer (not sure how that's possible, but...if you are), this is THE ONE. 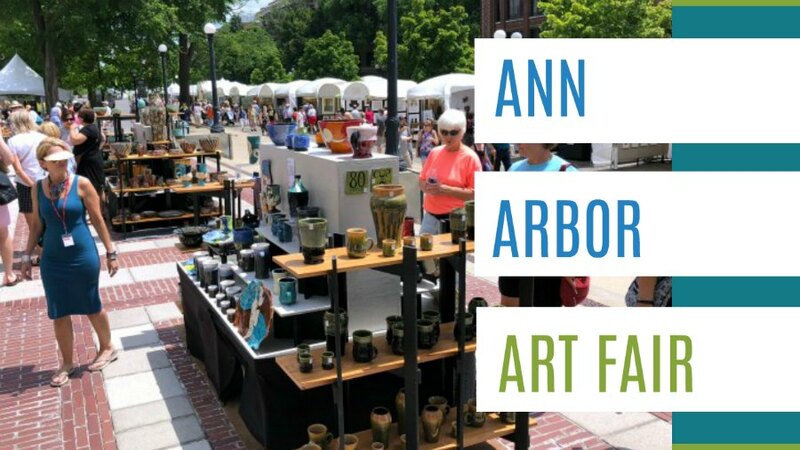 The Ann Arbor Art Fair has expanded into four art fairs in one. There's sculpture, ceramics, paintings, fiber art, clothing, jewelry, leather, glass, metal, digital art, photography, print making, wood and so much more. 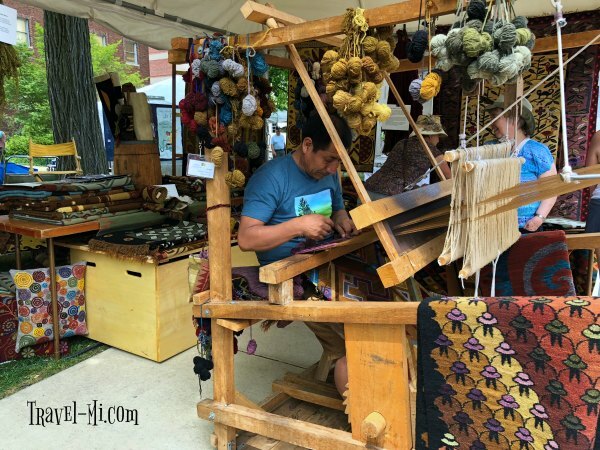 Ann Arbor Art Fair is one of the largest outdoor art fairs in the nation!! You will see street performers, enjoy sidewalk sales, culinary treats and so much art! The Art Fair is massive, hot and sweaty, vibrant, exhausting and just absolutely FABULOUS. We go every year, probably for the past 15 years. OH MY GOSH I LOVE IT. Live demonstrations make this art fair special. I LOVE LOVE LOVE seeing artists creating their craft. It makes your purchase so much more special and meaningful. You will see wood carving, painting and other demonstrations during your visit. The University of Michigan's campus is just spectacular. The vine covered buildings, gorgeous lawns and stunning architecture is a sight to see. 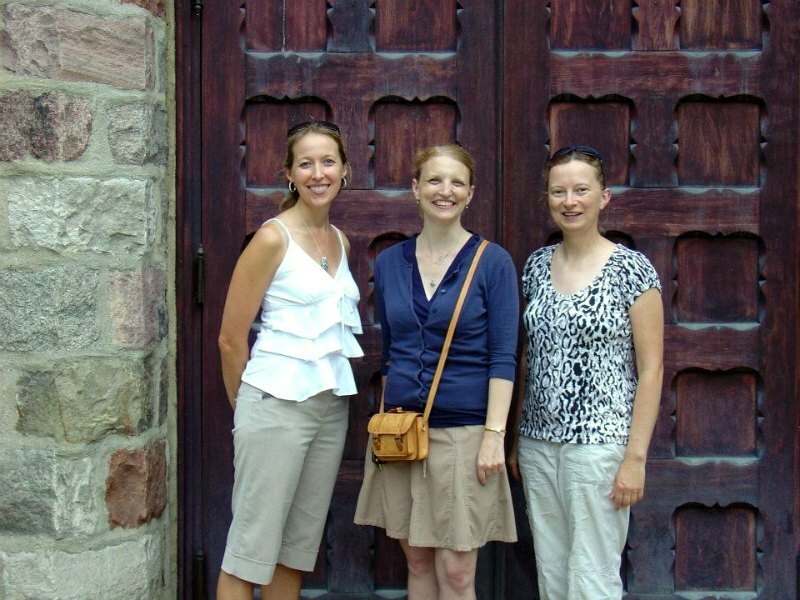 We adore these massive doors and have several photos in front of them year after year. OK guys, it's so important to properly prepare for your art fair adventure and know what to expect so you can have a great time. Expect full sun and all pavement with TONS of walking. This is an all day show. SO...wear a wide brimmed hat, slather on SPF 70 or higher sunscreen, wear light and airy clothing and athletic shoes. Bring water and $1 bills to buy more throughout the day from the street vendors. I hear ladies saying all the time that they wished they weren't wearing "these cute shoes" because after 4 hours of walking in 90 degree heat you will be cranky and nobody wants that. It's not cute. It's enough work to stay pleasant in the heat without being sunburned and your feet hurting. WHERE TO PARK: We find it very convenient to park at the Briarwood Mall located at 100 Briarwood Cir, Ann Arbor, MI 48108. It's very difficult and sometimes expensive to try and find parking closer to the show. Taking the buses from the mall is our go-to parking location. Plus you can pop in the mall to use the restroom and get a drink if you traveled a distance to get there. It's only $3 for a round trip ticket and the buses are nice and air conditioned. Just expect to wait a bit to get on the bus. 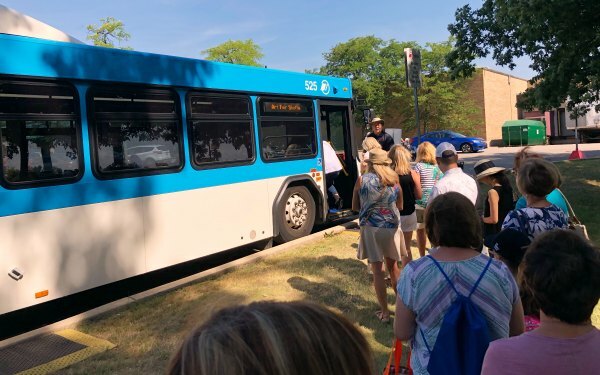 Note: There is another bus from the high school that picks up and drops off at the same location at the fair so make sure you are getting in the correct bus when returning from the art fair. There are numerous stores, restaurants and spots to get out of the heat and relax. Be sure to drink lots of water so you stay hydrated. We generally stop for lunch within an hour of arriving, stop again about 1.5 hours later for a cupcake, then get we cold coffee drinks a bit later. It's necessary to stop often so you don't fatigue or overheat. Pace yourself. 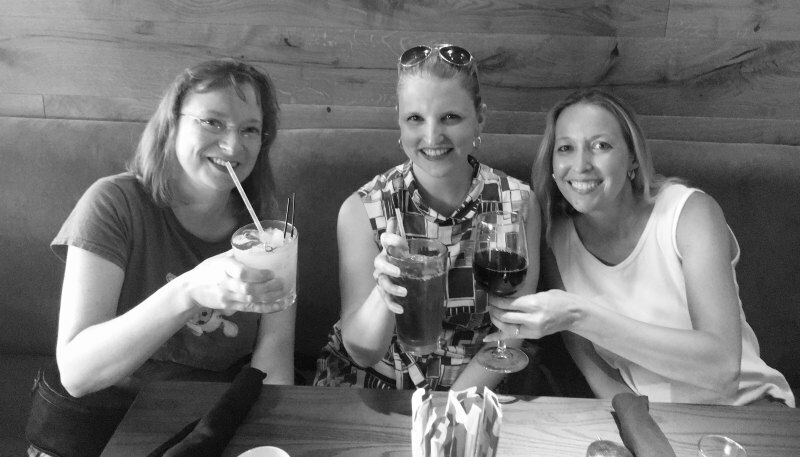 Every year we look forward to enjoying Sushi at Mama Satto Sushi and Noodle Bar located at 715 N University Ave, Ann Arbor. It's centrally located right in the middle of the art fair. We always get the window seat so we can people watch as we eat. We also have a tradition to stop and cool off while enjoying a sweet treat at the Cupcake Station located at 116 E Liberty St, Ann Arbor. Then to finish off the day we have dinner and drinks at PF Changs located in the mall where we parked.